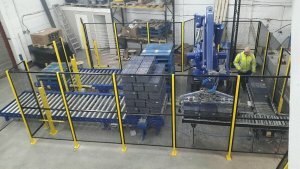 Andrews Automation Ltd specialise in a wide range palletising solutions, using a variety of branded products including ABB robot systems. We are able to supply vacuum head systems, ideal for solutions where a number of different sized products are handled, as well as systems with bespoke gripper heads for those items that are tricky to handle such as distribution tote bins. Whatever your requirements, our aim is to supply you with a cost-effective and reliable palletising solution that is operator friendly and safe.